A good, hearty laugh comes with myriad health benefits. We speak to Dr Mahesh Parikh, founder of the Laughing Club at Mahemdavad, the 321st Club in Gujarat, who has witnessed people recover from severe respiratory problems, high blood pressure, and other health complications with laughter yoga. Why do we need a Laughter Club? A club means an association of people with common interest. The Laughter Club is a gathering of persons interested in maintaining their health, because any exercise done in a group has a cumulative effect and gives better results, than if done alone. What motivated you to start your Laughter Club? Dr. Mukund Mehta from Ahmedabad, convenor of Laughing Club, Gujarat, motivated us to start the Laughing Club at Mehemdabad (Dist. Kheda). Our club is the 321st Club in Gujarat. It was started on 17 May, 2009. How many members are there and what is their profile? We are very few members in our Club. 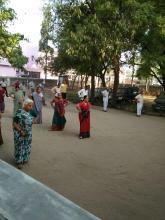 About 18 to 38 members meet every morning for laughter yoga exercise from 7-7.35am at Vaijanath temple. Our members comprise senior citizens, house wives, retired govt. officers, doctors, scientists, etc..
What are the origins of laughter yoga? I think it was started by Dr. Madan Katariya, founder of the worldwide Laughter Yoga Movement, in Mumbai in 1998. Why has Laughter yoga become a worldwide phenomenon? Laughter yoga has become a worldwide phenomenon because it has been accepted by society in general and medical science and spiritual science, in particular, all over the world. What is the philosophy behind Laughter Club? Philosophy behind the laughing club is to keep every citizen healthy, happy and prosperous by doing laughing exercise and breathing exercise, that is laughter yoga. Could you list out the therapeutic benefits of laughter? Could you narrate one or two instances where people have benefitted in your Club? In our club, there are number of the persons have been benefited by this exercise of laughter yoga. Manhar Rana (58) suffered from shoulder pain 8 months ago. With regular exercise in our club he recovered fully without taking any medicines. Uma Parikh (67) suffered from recurring cough and cold for the last 8 years, particularly in winter. Now she has recovered totally and has had no episodes of cough and cold. Nirmala Joshi (61) had high blood pressure (150+). Regular exercise at the Laughing Club helped her control her BP. How is voluntary laughter different from spontaneous laughter? Spontaneous laughter, which occurs as a result of sudden impulse or inclination and without premeditation, may or may not have the desired effect on your body and mind. While in a voluntary laughter, which is acting of one’s own free will, has a positive impact. So, would you say ‘Laughter is the Best Medicine’? We firmly believe that Laughter is the BEST MEDICINE and I wish to convey this message that everyone should spare at least 30 minutes, preferably early morning or evening, for laughter yoga exercise to remain happy and healthy. So are you ready to start your own Laughter Club? Or an Exercise Group?